There is something wonderful about a blank page that is similar to the start of a new calendar year. It feels like hope. When your ideas and goals are put from your conscious mind to paper, your vision, like magic, becomes achievable and real. I have a dear friend who I gift each birthday with a new journal. I have always found his thoughts fascinating and peculiar, yet quite clever. I honestly have no idea if he is writing a word in them, but selfishly I hope that these grand philosophies are preserved for someone to find and enjoy years in the future. The start of each calendar year, like a new journal, has the potential to be full of opportunity, optimism and endless possibility. Cheers to blank pages! In 2001, Head over Heels, owned by Susan Brooks Holiday, opened its doors in Baton Rouge. It quickly became one of the state’s most reputable boutiques for on-trend and up-and-coming designers. In the past years, Head Over Heels has organically added in clothing and a wide range of accessories. Now 15 years later, and just down river, Brooks Holiday opened her New Orleans location. She and her staff are thrilled to meet and work with the well-heeled ladies of Nola. The open and modern space, that was formally home to Frock Candy, is filled with contemporary clothing brands to satisfy the most discerning trendsetter as well as an expansive inventory of remarkable footwear at moderate price points. Hoping to fill a void in the high-end boutique market on magazine, Pilot + Powell opened last November. Filling the stunning space with modern classics and timeless luxurious pieces, Kathryn Bullock Joyner and Coeli Hilferty Boron have created the perfect blend of ease and chic to meet the needs of the fashion-forward Southern woman. Bullock Joyner and Hilferty Boron have an impressive retail background, and we are certain these two shop mavens will keep the store on point and ahead of the trends. Pilot + Powell will have all fashion lovers in shock and awe. Carrying lines such as Philip Lim 3.1, Malone Souliers, Adam Lippes and Proenza Schouler, this boutique will be a place to lust after and love. Monomin is the aggregate of the words Monochrome Minimal, which sums up the brand created by Rachel Hall Taravella. Although the store is filled with neutrals, solids and classic pieces, Monomin is far from ordinary. Taravella is intrigued with the similarities between architecture and fashion. “From a very basic level, they both protect and shelter your body, yet, from the creative standpoint, they are both expressions of personality and tastes,” she says. With minimalistic sensibilities, Monomin is affordable, feminine and carefully curated. Clothing price points range from $50 to $200, with lines like Just Female from Denmark, Cluse Watches from the Netherlands and Dear Maison Stationary from Korea. The store also has on offer Australian brands like C/Meo, Keepsake, Elliatt, Mode Collective and Grown Alchemist. An interesting add to the inventory are the City Guides by Cereal Magazine and The Gentlewoman magazine. If New Orleans had a home for baby fairies, they would live here. 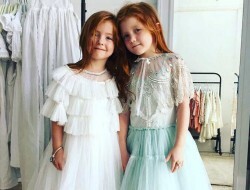 This new angelic boutique for children is the sweet sister store to Peony at 2240 Magazine St. Petite Peony is another celestial vision brought to life by of Jennifer Atkins and Cricket Lapeyre. This enchanted place carries clothing for little girls from preemies to size 14 and boy’s infant to size 8. Petite Peony — like its predecessor Peony — has breathtaking fixtures and magical creations by Tattered Design artist Kaki Foley. “Petite has very special things for little girls; everything inside is magical and interesting,” Atkins says. From high quality organic basics to The Heirloom Collection of gowns by Bryce Revelry of Gentle Arts, Petite Peony is a captivating fantasy for children’s gifts, clothing and party goods. Happy New Year! Happy shopping, and cheers to blank pages!